European markets opened with big falls after a post Fed reversal last night on US stock markets as the FOMC signalled that it was not quite ready to end its monetary stimulus activities for fear of harming the fragile economic recovery. This cautious stance caused investors once again seek the safety of fixed income with an opposing move away from commodities such as oil. As a consequence daily oil prices suffered a huge one day fall, dropping to below $69 for the first time this month, and they were not helped by very bad crude oil data released earlier in the day. There was some volatile action in the immediate period following the Fed release statement but with question marks over the strength of the economic recovery, investors flocked to the perceived safety of the dollar and yen. This morning the dollar flight is unwinding somewhat, while the yen continues its strong week. The yen is up by 1% against the dollar and up 1.25% against the pound. 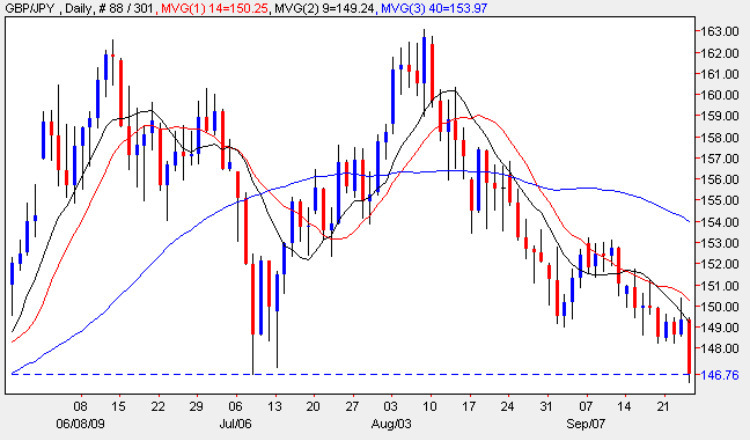 GBP/JPY is the biggest faller today at 147.44, the next support looks like it could be at 147.16 then 146.78. The state of the UK continues to become comparatively worse compared to many of its G20 partners and these level look like they could be hit sooner rather than later. One Touch traders set over the next few days for these levels could be the best way to play this.